We have detailed a magnificent earthwork to be constructed. It will be a mile in length so it will require a large plane. It will use three circles to display an idea composed of numbers. If it is properly placed, its power will be so great it will defy the ravages of time. It is decided that it will be placed 79.2 miles from the place that links many places of power and it will be placed 32 degrees longitude from another place of power. This number 32 is the most important squaring of 5.656 while 79.2 represents the diameter of the Earth. This mile long work of art actually exists just as described. It is laid out in a plain, not too close to the East Fork Works, with its mounds that run in straight lines, and not to near the great works in Newark with its similar design of concentric circles of mounds and ditches. The great ones of the past chose a flat plane that lies on line of longitude one, 1 , where many other mounds have been built. This mile long structure begins 79.07 miles north of Lincoln Cathedral, England and ends 80.05 miles north which places 79.2 miles within the middle of the structure. Indeed, it lies 32 degrees from the Great Pyramid in Egypt. But to add more power to the placement of these two great structures, they will be 32 degrees and 40 seconds apart. This number, 40, is great in beauty and power. We recall its power was used to poetically describe how long it rained during Noah’s travails and how many years Moses endured in the wilderness: 40 days, 40 years, and now 40 seconds. And what does this simple number reveal? A square 40 to the side has a circumference of 160 and an area of 1600. This is the important number 16 we saw in the Decalogue Stone: 16 x 16 = 256 or the number of letters on the stone. But most importantly a square of 40 has a diagonal of 56.56 and this most secret number is always with us. The site for this great work is chosen by aligning it with other places of power. Thornborough Henge in its newly finished form shimmered with white gypsum some 5000 years ago, 3500 to 2500 BC. It lies an ocean away from Ohio and the home of the mound builders. And so our mystery is now convoluted by time and great distance…..
Thornborough Henge in England. Image by 2013 Google, Digitalglobe, Infoterra Ltd. & Amp; Bluesky. The Ohio mounds, we are told, are rather recent being almost as old as the language in which this is written. Newark Earthworks, the largest complex in the world, are dated to 250 – 500 AD. Surely, scientists have discovered that Watson Brake complex in Louisiana dates to 5400 years ago or the same era as the Thornborough Henge. The Newark Earthworks were built, we are led to believe, by people who had newly discovered the geometry of a circle and how to use a rope to make one. Yet, the missing East Fork works suggests otherwise. We are further led to believe their significance had to do with their cosmology and it had no relation to our present day life other than being the historical religion of the native people at that time. These people, we are fervently told, came via a land bridge from Asia some 10,000 years ago even though they have lost the characteristics typical of Asians and look Caucasian-African. And while trucking over the continent they were stopped in Louisiana by a large gulf and there, some 5400 years ago, they built mounds. If these fellows had a ship, like the Egyptians of their era, they could have gone all the way to England and seen the distant ancestors of the English who had also just created mound earthworks! What a marvelous synchronicity! Oh, but what a dilemma for the scientist! Alas, he must choose between evidence of synchronicity or pre-Columbian (and pre-Leif) contact! 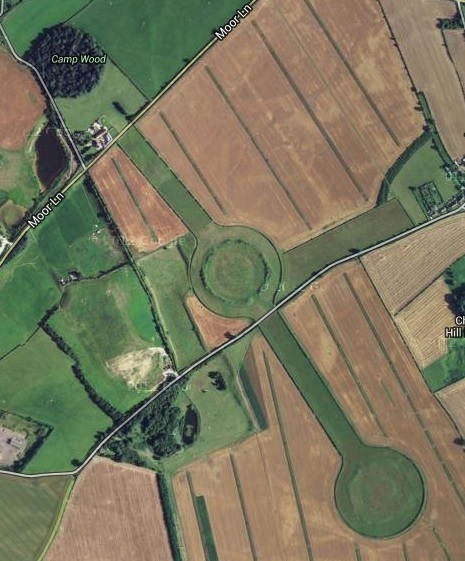 Perhaps if we understood what message lies hidden in this great earthwork in England we could grasp why they are similar? What is it that we still do not understand about them and these numbers? What is the importance of 56 and even 860? Of 16 and 584? Longitude measured by Neolithic people? Hidden messages, people traveling great distances, measurements that ought not be there, and identical structures built on unknown continents? This is all contrary to our education! So it cannot be. Perhaps there is something here we really do not want to understand. Perhaps they have drawn it out for us as plain as day but because of our education we cannot see it.